Winter slows me down. Shopping takes a lot time, every step out too... I make my spring bags collection slow, I quite don't believe winter will be over! Such a bad mood! 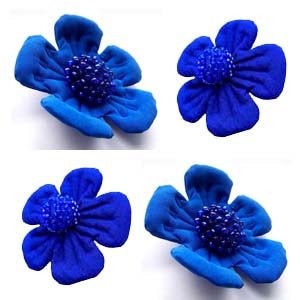 This fower brooches were done to make nicer atmosphere in my studio. I want create more and more textile jewelry, because fiber art is my huge love! Why I'm not one of this amimals which sleep during the winter? Why? jajajjaja Your brooches are really delightfull, im glad that you make it ! I'm in the other part of the globe !! Suffering the heat of the summer ( more and more heavy each year) and traying to do some work too , I can't blame on my pregnancy beacuse i still have no belly almost ( 4 month only) but I'm sleepy ALL the time ! I can't even think of winter yet .. I want my summer vacations first !! I think about you and wish you the best. And of course admire what you do! I like your fashion lessons!!! We have now minus 28 celsius but I'm sending hot regards! Zapraszam po odbiór wyróżnień. Pozdrawiam. Such a lovely blue to chase away the blues. A bo gdybyś tak zasnęła na zimę, to kto by zrobił takie cudne kwiecie pośrodku tego śniegu, hę?